The Bucktown neighborhood located on Chicago’s Northwest Side is home to many working professionals that share a love for competitive sports. Bucktown is located just along highway 290, which is the main artery for reverse commuters that work in the suburbs. “It can be difficult. I live downtown, I play downtown, but I work in Glen Ellyn. It makes for a long day.” Bucktown resident, Connor Leamy said. Like Leamy, many Bucktown residents make that daily 20-mile trek along 290 towards the Western Suburbs. Within eyesight of highway 290, in Glen Ellyn, is a private club called Health Track Sports Wellness. Health Track is situated between numerous office buildings and an off campus Central DuPage Hospital. Ordinarily, Health Track is filled with local members that live within about five miles from the gym. However, this isn’t the case during the weekday noon-hour. 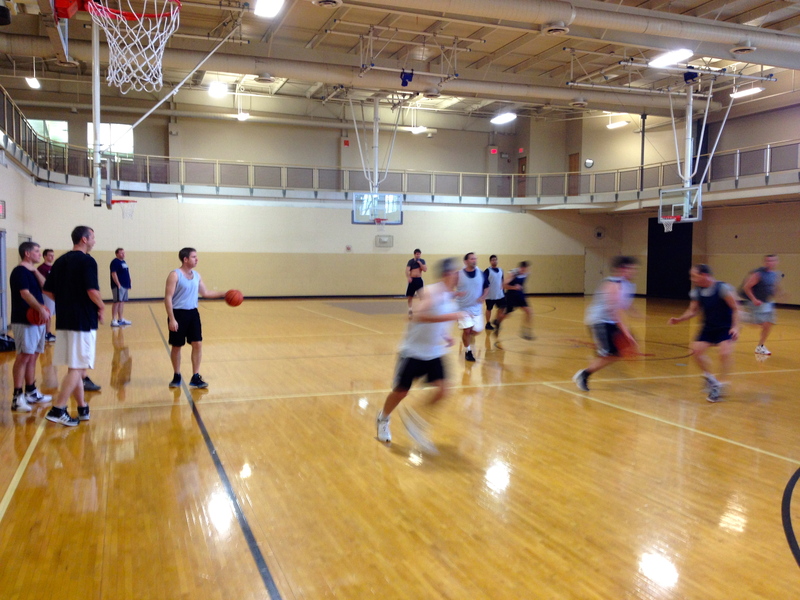 For about two hours each day the basketball court becomes an intensely competitive environment, made up of doctors, lawyers and financial analysts. Add then that many of these guys have played sports competitively since they were in elementary school. The roster of guys includes three All-American football players, two former Major League Baseball players and a host of other collegiate athletes, most of which reside in the Bucktown neighborhood. “I think it is really funny. I mean, I have been playing here for a few years and see these guys every weekend downtown at bars and stuff. Then I have to see them here too.” Emmet Carrier said. Carrier, of the 1600 block of North Avenue, actually plays here with his brother Riley, who works in Glen Ellyn, but lives in nearby Wheaton. “Lunch ball is awesome, man. It is a great midday workout, it allows me to see my brother and it’s tremendous competition.” Riley Carrier said. The Bucktown West League, as they call it, exists mostly due to commonality. Over the past 15 years, numerous players from the Bucktown West League moved to Glen Ellyn once they began to have families. “Guys like Brad Rosley, who moved here from Bucktown, keep our group connected,” Riley Carrier said.